It's been very flattering when someone describes me as an alpaca whisperer but in truth, I like to think of myself as more an alpaca "listener." 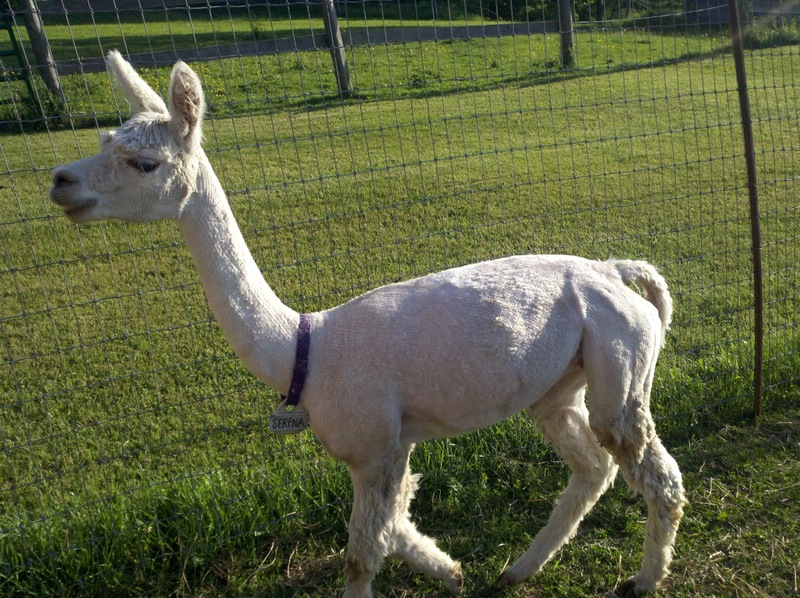 One of the very cool things about the alpaca industry is all the various backgrounds of folks that wind up in the alpaca business. We come from all walks of life. One of my walks was as a counselor. I got my Master's Degree in Counseling Psychology. From that training and education, the most important skill I developed and enhanced was my listening skills. It takes more than just listening to a story a client has to tell. You listen to their body language and other non-verbal communication to get the entire story and clues of what is going on. The subtleties are important and one develops an ear for it. I liked the term, "Listening with a Third Ear." It really isn't that big of a leap then to being an alpaca listener with that sort of training and background. I enjoy observing these beautiful animals. Most of the time, I'm not even aware I'm doing it but I know I'm taking in a lot of information as I gaze out and take in my animals. Most of the time I see relaxed normal alpaca behavior. They are grazing, napping, or once in awhile having a spat with each other. However, every now and then, one sees something that isn't normal. It is usually pretty subtle. Alpaca instinct is to hide a weakness. They are prey animals so a predator will zone in quickly on a weak animal. Therefore, noticing any subtle change or difference can be an important clue that an animal isn't feeling well. If you wait until they really show you they are sick, it is often too late to help them or very costly with vet visits or a trip to the veterinarian hospital. I had a female in labor awhile back. 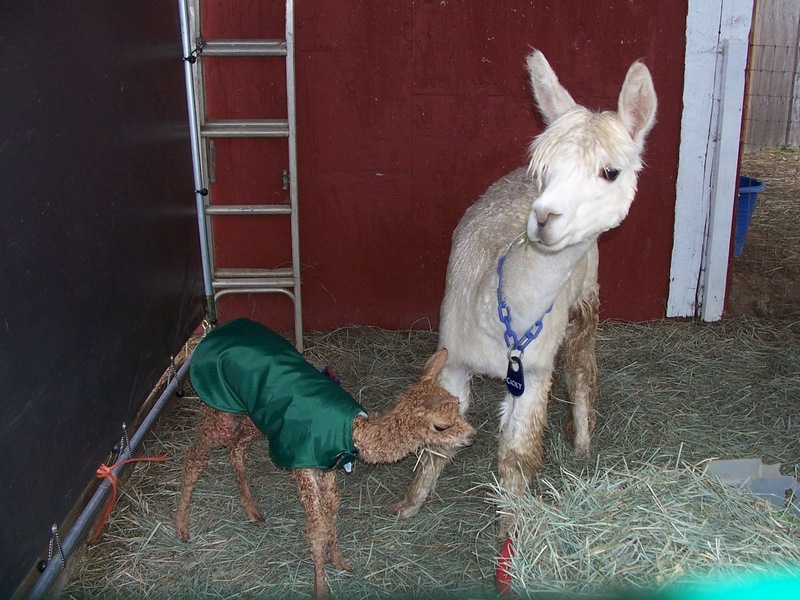 This dam was one that I was sure she would find a hidden area and have her cria. I was just going to come out and find her with a baby on her side. I just knew it. She was that kind of animal. Sweet and easy to handle but just didn't want to be near any sort of fuss. I looked out my window and sure enough, I saw a head sticking out of here rear end and she was about as far away as you can get on my farm. I grabbed my binoculars and headed out. I kept a nice distance away but wanted to be able to observe the proceedings yet be respectful of her desire for space. She saw me though. But, much to my surprise, instead of trying to move further away from me, she came running TO me. Her eyes were big and I knew immediately that she was needing help. I normally would give more time to see if things would progress on their own but I could tell she was asking for help. I called my neighbor for assistance and grabbed my birthing kit gear. We caught her in the open field which was another sign that she needed help that she let us catch her so easily. I examined her and sure enough, not only did the baby have one leg back, he had both of his front legs pinned back. I worked and untangled his legs and out he popped. It seemed obvious to me that she was asking for help but others that were around asked how I knew. Maybe it was that long ago former life as a lifeguard that told me. You can tell when someone is in trouble by the look in their eyes. Her eyes were sending a real clear message. HELP! That was a cool day. Bringing a new life into the world was rewarding in itself but when you connect with an animal, especially one that is not normally inclined to connect with a human, it is a very special day. A fun way to teach alpacas about halters and make halter training easier is to play what I call the Halter Game. I typically start training weanlings (about 6 months of age) about halters and start teaching them to walk nicely on halter and a lead rope. I can start the halter game as soon as the alpaca takes food from my hand. 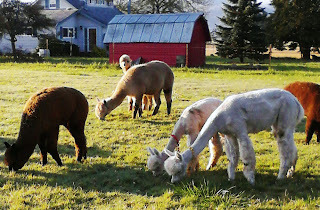 I don't put the halter on them but I use the technique of "luring" to get the alpaca to stick their nose through the halter's nose piece. What is great about this is that it gets them used to having the halter on their nose and they are choosing to stick their nose into the halter. I typically will start with a larger halter than they would wear (The larger size is just to play the game. 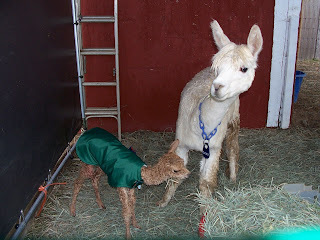 It is important to have a properly fitted halter when it comes time to actually putting one on an alpaca). I like to use the Zephyr or Sopris halters and I will use an adult size that has a larger opening to play this game initially. It is larger for them to stick their nose in and not feel like it is tight around their nose. In the beginning, I may have the halter up on my arm just so they can see it and get used to it dangling about. I click and reward them for coming near the halter. Once they get used to that, I slip the halter further down until I can hold it in the hand that I have my clicker in. 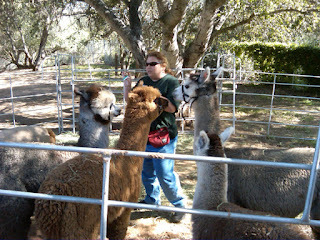 I use my other hand to hold the treats in and lure the alpaca encouraging them to stick their nose through the halter to get to the hand with the treats in it. The hardest part of playing this game is getting the coordination of holding the clicker on a side piece of the halter and holding the halter up, clicking at the moment the alpaca stick its nose through and feed with the other hand. You kind of have to be like an octopus and grow more hands when doing some of these exercises but it can be done. 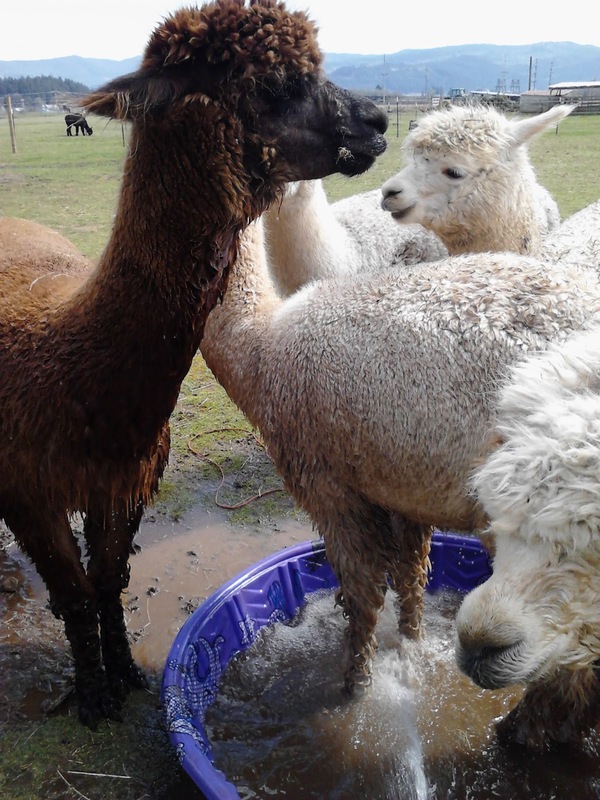 By playing this game with your cria and weanlings prior to actual halter training, the alpacas get so used to seeing the halter and seeing it as something fun. When it comes time to putting the halter on, it is no big deal to them. They are already used to it on their nose which is typically the most frightening part for them. If you think this game will take a long time to teach them, you're wrong. I can usually get an alpaca to stick their nose through a halter for the first time in a matter of minutes if they are comfortable taking treats from my hand to begin with. That is always the biggest hurdle in clicker training your alpacas. Get them to take food from your hand and the rest is relatively easy. This game can be played with adult alpacas too. Even experienced alpacas that have been trained to walk nicely on the halter can learn to enjoy the halter more by teaching them this game. It will make life easier in catching and haltering the adults as well as the youngsters. The training I do is all about reinforcing the behavior I want and rewarding it. The key is rewarding with positive reinforcement. Most of the time that is a treat. 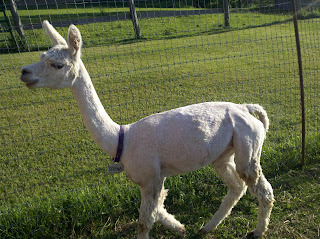 My alpacas like their pellets and some enjoy carrots, apples and sweet potatoes as some of their favorites. But what if your alpaca doesn't like any of those treats or won't take a treat from the hand? Can you still train with a positive reinforcement method? The answer is yes. I try and find something they like. I have two new girls that I purchased recently and they still think I'm a two-legger that should be avoided at all costs. It's been a long winter but now that the weather is warming up, I have discovered that these two girls love being hosed down. I offer them the hose if I'm filling up the water buckets squirting down their bellies and legs. One raises her front leg to request more and I am always so happy to oblige. I am showing this girl that I'm listening to her and respecting her wishes for more hose. Such a simple act and yet it has done more to establish trust than all the treats I've offered. One of my new girls is beginning to take carrots now! Although she won't take from my hand yet, carrots tossed at her feet are gobbled up. It won't be long before she starts to take those from my hand. It can take some patience when dealing with an animal that isn't super food motivated or their mistrust in you is more than their food desires. But finding that thing that they love and being patient, you can overcome a lot. Once they decide you're ok, the training will increase rapidly. I had a female that had a horrible reputation as a spitter come stay at my farm. I admit I wasn't enthusiastic about having her but after only a few days here, I saw her behavior was based on fear. I saw it in her eyes as I walked past her one day. I can deal with that. Cranky animals are one thing but ones that are coming from a place of fear, I can more easily work with. I discovered she too loved the hose. She wouldn't come near me to get treats but the hose, she would come right away to get a good squirt down. She would let me touch her if I was spraying her and she would come right up close to me on her terms. Once I started hosing her, the treats came quickly after that. She loved to come and participate in conversations. Her head would go back and forth as if she were listening to whomever was speaking. Then she learned to give kisses for her carrots. She was quite enthusiastic about giving kisses. Within a couple of months, her owners barely recognized her because she was so friendly and enjoyed coming over to say hello. And, it all started with the hose! I'm hosting and teaching my Positive Reinforcement Training workshop for alpacas April 21, 2012. 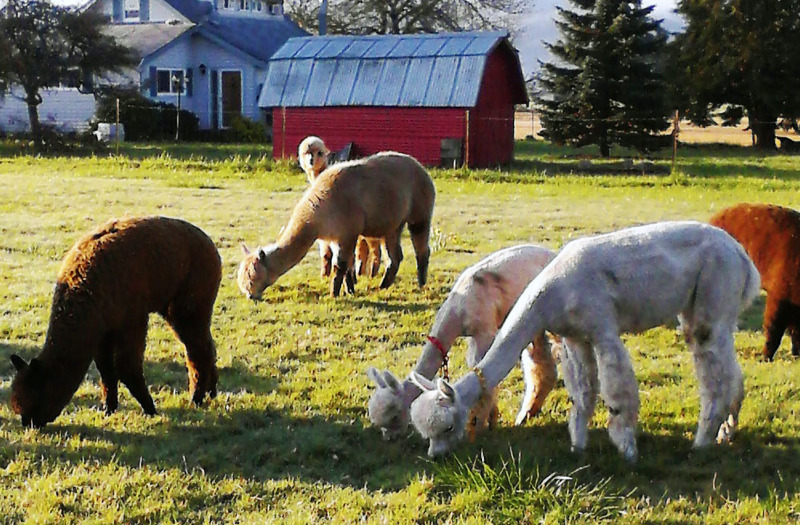 This workshop teaches you how to work with your alpacas in a gentle, positive and respectful manner using proven techniques. These methods will help you socialize your animals making them much easier to handle, less stressed and save you time. Animals trained and handled using these positive reinforcement techniques tend to sell faster too!